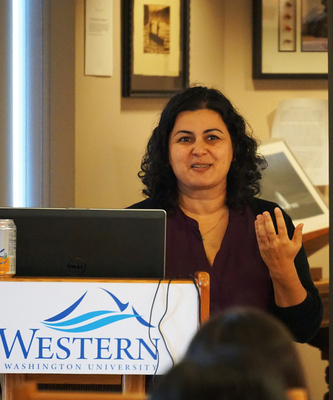 Western Washington University Associate Professor of Political Science Shirin Deylami gave a talk entitled “Is Watching Television a Political Act? 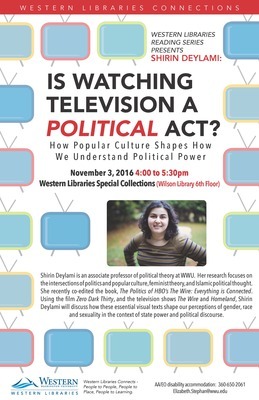 How Popular Culture Shapes How We Understand Political Power,” at 4 p.m. on Thursday, Nov. 3 in Western Libraries Special Collections, (Wilson Library 6th Floor). During her talk, Deylami used the film “Zero Dark Thirty,” and the television shows “The Wire” and “Homeland,” as examples of visual texts that influence our perceptions of gender, race, and sexuality in the context of state power and political discourse. This event is being offered as part of the Western Libraries Reading Series, dedicated to showcasing the scholarly and creative work of Western Washington University faculty and staff by featuring diverse speakers from a variety of backgrounds and disciplines who are engaged in research, writing, and teaching at Western. For more information, please contact Elizabeth Stephan at (360) 650-2061 or email Elizabeth.Stephan@wwu.edu. Television programs--Political aspects--United States; Popular culture--United States.